For Thanksgiving (American-style) this year, I was assigned the task of bringing dessert. Not yet feeling a mastery of pie crusts, I was at a loss for interesting and tasty ideas. Until the Food Network rescued me. I was watching a special Thanksgiving episode of Throwdown with Bobby Flay, in which the Pioneer Woman challenges him to a five-course Thanksgiving dinner cook-off. I’ve been following her blog for a few months now, which is why I was interested in watching in the first place. On the show, Bobby Flay made a pumpkin bread pudding for dessert, and it looked incredible. So I thought I’d give it a shot. I put the recipe together over a couple of days to save myself some stress. 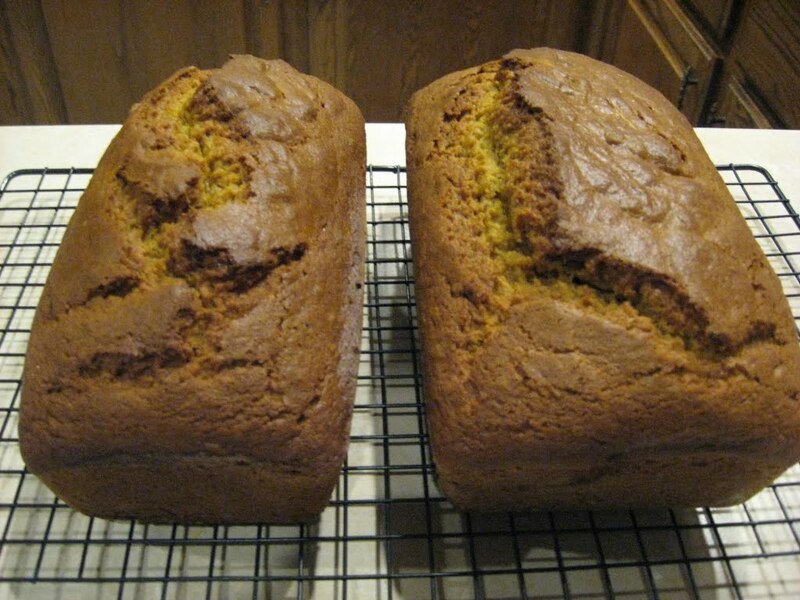 A couple of days ago, I made pumpkin bread using my friend Tasha’s recipe. 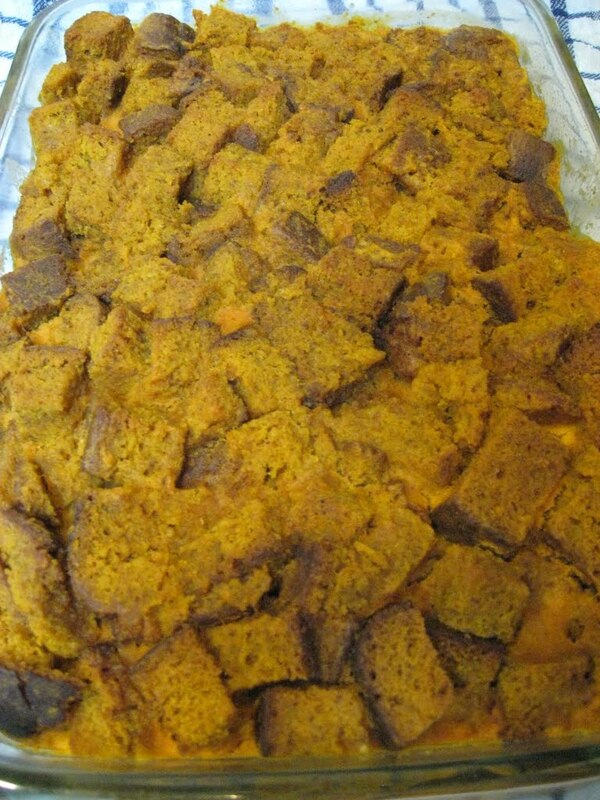 It really is the best pumpkin bread I’ve ever had, so even if you’re not going to make the whole bread pudding thing, at least give this bread a try. And read her blog sometime – she’s got some great recipes on there. Lucky for me this recipe makes two loaves, because we couldn’t help ourselves from slicing into one of them that night when it was still warm from the oven. I think I’ll be making mini-loaves to give away to co-workers for Christmas this year. Plus extra for me. Last night, I made the Pioneer Woman’s Maple Whiskey Cream Sauce. I had to ask Dave to pick up some bourbon for me, because it’s not generally something I’d have in the house because we’re not big drinkers (especially not bourbon or whiskey). Actually, I asked him to bring me a bottle of Colonel Kwik-e-Mart’s Kentucky Bourbon, but he couldn’t find it and brought me Maker’s Mark instead. I considered leaving the booze out, but she raves so much about it on her blog that I decided to stick to the recipe, at least the first time. It turned out so incredibly good. It took ages to thicken up and I gave up and decided to let it cool in the fridge while it was still fairly liquid, but when I pulled it out today to use, it was exactly the right consistency. I stirred it to check, and then I used the spoon to see that it had exactly the right flavor, too. I want this sauce on everything now! This morning I got up early and cut up the bread into little cubes and toasted them in the oven while I was watching the Macy’s parade. Then I followed the directions from Bobby Flay’s Food Network site, skipping the sauces and substituting my own fabulous fresh pumpkin bread. I tweaked the recipe a little, using 1.5 cups of light cream and 1.5 cups of 1% milk, instead of the 2 cups heavy cream and 1 cup whole milk he calls for. It just seemed too heavy for me. And since I don’t have fancy-schmancy real vanilla beans lying around, I dumped in a tablespoon or so of vanilla extract. I served it tonight at Thanksgiving dinner, with a drizzle of the sauce and a blob of whipped cream. Fantastic. Really. My mother-in-law has decreed that this shall be a new Thanksgiving tradition, so you know it’s got to be good. We split up the remaining bread pudding (and sauce) so everyone could bring some home! I give full and grateful credit to Tasha, Bobby Flay, and The Pioneer Woman… I just assembled it all! This entry was posted in Uncategorized on November 26, 2010 by antijen. I’d like to eat this up.